With no beach at the Picket Fence you had to stand in the water to fish! With the water level of Lake Coleridge high for Opening Weekend 2008 the shingle beach around the lake margin, which at lower lake levels permits an easy stroll, was instead mostly under water. Therefore it was necessary to climb up hill to get around the lake shore. The area around the Picket Fence, at the head of the lake, was particularly difficult to get to with big waves crashing into steep banks and dense bush right down to the waterline! 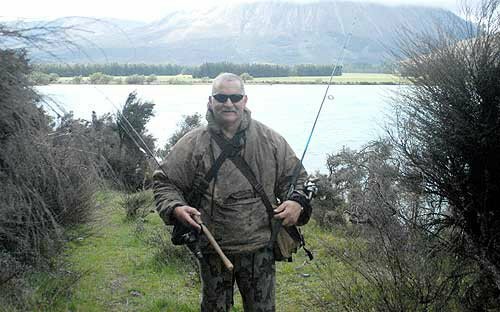 This meant that anglers on foot determined to head towards O-Rorkes Fan were in for a difficult tramp around the hill where the poorly defined path was frequently blocked by dense thorny matagouri bushes and thick brush. At first light a howling norwester and driving rain made conditions even more trying. Those who did make the effort were rewarded with fish. 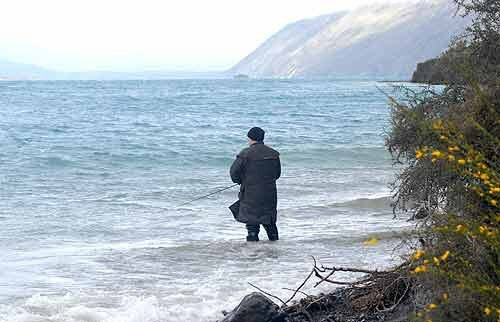 Often when conditions are poor for fishermen; they are good for fishing! The author pauses for breath on a clear part of the track above the Picket Fence. A number of new baches have been built at the Harper end of Lake Coleridge in recent years. These baches have now all been removed. I noted also this year that fewer anglers had made the trip than in the past. Perhaps the dour weather forecast had been enough to scare many away. The rough conditions on opening morning also prevented many boats from going out. So there wasn’t the usual congestion at the Harper River end of the lake. By mid morning the wind had dropped, the sun began poking its head out between the clouds, and the rain had almost disappeared! My sons and I headed around to Lake Selfe where we managed to catch and release several good fish – though not deliberately – before landing a good brown and several smaller rainbows. I noticed that there have been a number of new baches built at the Harper end in recent years. 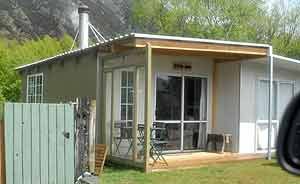 In New Zealand we call a small holiday cabin a bach. In Otago and Southland they are also called cribs. Perhaps most anglers are now staying at Lake Coleridge in baches rather than tents. Harper River – Lake Coleridge.